The newly revised Yaris is just going on sale with an entry price level of €14,995 for the Terra 1.0 VVT-i Manual 3 door and a similar spec and engined five-door version for €15,995. 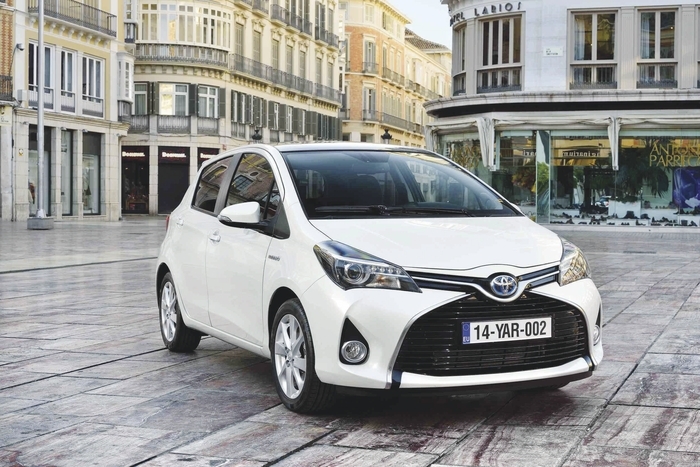 The entry level diesel version is a Luna 1.4 D-4D Manual five-door for €18,570 and the starting price for a new 2014 Yaris Hybrid is €19,500. The exterior is quite distinctive with stronger design including the front which sees the upper and lower grille merge at the chrome trim bar underlining the Toyota logo. This chrome trim bar then runs the length of the upper grille into the new design headlamp clusters which now incorporate daytime running lights. To the rear, there is a new bumper and diffuser which gives the Yaris a more sporty stance while the new upgraded lamp clusters further enhance the new 2014 look. Unlike the outgoing model, all powertrains share the same overall exterior design with more subtle cues identifying the different versions. The new Yaris continues to be available with 1.0 VVT-i, 1.33 Dual VVT-i (with both six-speed manual transmission and MultiDrive ), 1.4 D-4D and 1.5 Hybrid engines. However, Toyota tells us that each engine has undergone improvements to reduce CO2 emissions and noise and vibration levels. Stop and start system is no longer fitted on 1.33 versions. CO2 has been reduced on all the petrol engines in the revised Yaris. For example he 1.0 Manual version sees a reduction of 12 grams to 99g; the 1.33 Manual reduced by 6 grams to 114g; and the 1.5 Hybrid - reduced by 4 grams to 75g. The diesel 1.4 D-4D remains at 99g. Toyota tells us that the new Yaris will now have Toyota ‘Touch 2’ version from Luna grade up. The Touch 2 for Yaris now incorporates a 7” screen (vs outgoing 6.1” ), and the system has an improved menu display in higher resolution, and a more intuitive interface and includes the new Mirrorlink feature, as seen on the Corolla, RAV4. This has meant that the six-speaker CD audio with USB connection (Aux-in has been discontinued ) is standard on Terra and Aura versions but had to be removed on the higher spec versions to allow for the 7” touch screen. Another improvement for the new 2014 Yaris is the location of the USB connection. Previously, it was located in the glovebox but for the new Yaris it has been moved to the centre console (under the heater control panel ) and is easier to access. A further improvement is the addition of a storage compartment underneath the USB connection. From Luna grade up, the storage compartment gains a lid adding to the convenience of listening to and storing an additional audio device. The specification grades availability for new Yaris continues to be the: Terra, Aura, Luna, Sol, Hybrid and Hybrid Luxury. There is also an optional lounge pack available for the Sol. Lounge pack* version, but it is not offered with fire red, island blue, or light blue body colours. Standard spec on the new 2014 Yaris (Terra ) includes seven airbags, vehicle stability control (VSC ), daytime running lights, follow-me-home headlights, a tyre pressue warning system, door mirrors with electric adjustment, driver seat height adjustment, Audio controls on steering wheel, remote central door locking, front power windows, the aforementioned front storage compartment (under USB connection ), and a jacknife key fob. Citroen C1 named most reliable car by Which?